The Ford Motor Co. had an informal, effective EMS during the 1920s, when the company could have legally dumped into the river whatever wouldn’t go up the smokestack. Henry Ford wrote explicitly that every waste stream represents wasted money, even if there are no disposal costs whatsoever. One of his contemporaries added that dark smoke from a chimney signifies wasted money because the dark particles are unburned coal. Ford grew up on a farm, so he was probably familiar with the meat packers’ adage: “We use everything but the squeal.” Although this isn’t something we’d care to think about while consuming hot dogs, we should remember that these foods probably evolved during an era when hungry people couldn’t afford to throw away any part of an animal. Manufacturers should think exactly the same way when designing an EMS. The recovery and recycling of waste materials, such as metal shavings and wood scrap, is an obvious way to recover some money, but it’s the last resort for materials that can be put to no other use. “We treat each tree as wood until nothing remains which is serviceable as wood,” Ford wrote, “and then we treat what remains as a chemical compound to be broken down into other chemical compounds which we can use in our business.” ( Today and Tomorrow , Henry Ford and Samuel Crowther, Doubleday, Page & Co., 1926). Ford’s wood-distillation plant earned $12,000 a day when he was paying his workers $6 a day, which was a very good wage at the time. In other words, distilling the unusable wood paid for 2,000 workers. The slag from the company’s steel mills, meanwhile, was converted into cement and paving materials, which were then sold. This is where design for manufacture (DFM) comes into play. Even something as simple as changing the size of the material stock can save the ends of metal billets and wooden boards that would otherwise be cut off and thrown away. As an example, if parts are 11 inches long, a manufacturer would want the stock to come in lengths of slightly more than 66 inches, to allow for the cuts, instead of six feet. Then there’s no recycling, because there’s no leftover material to recycle. Any pile of metal turnings or shavings from a machine tool should attract immediate attention, as they did at Ford’s Rouge River plant. Ford’s position was that small parts should be cast, forged, or stamped and then welded together to produce the final product, as opposed to casting a large piece and then machining away the unwanted metal. He cited the example of an oilcan holder that was made from a cross-shaped piece of metal. The pieces cost 6.35 cents when stamped from a metal sheet, but welding two straight pieces together reduced the cost to 4.78 cents, a 25-percent reduction. The reason was that welding two pieces together left no unstamped sheet metal to be sent back to the blast furnace. processing techniques are good examples of such processes. DFM and innovative process designs are ways to reduce waste. Before a manufacturer can reduce waste, however, that waste must be identified. This is where material and energy balances similar to those used by chemical engineers come into play. Farmers have extended the “everything but the squeal” philosophy by asking where the animal feed goes. The obvious answer comes from applying the chemical engineer’s mass balance concept, “Input minus output equals accumulation.” The input is the food, obvious outputs include what the animal metabolizes to stay alive plus indigestible components (i.e., manure), and the accumulation then consists of desirable products such as meat, wool, and so on. Sheep and cattle, or more precisely the bacteria in their digestive systems, also convert food into methane, the primary component of natural gas. Unless the farm can somehow collect this methane, it represents wasted food. Some Australian scientists believe that a vaccine to alter the microorganisms present in the stomachs of ruminants will not only reduce Australia’s greenhouse-gas emissions, but also increase the profitability of Australia’s sheep and cattle industries. According to a Sept. 13, 2000, News in Science report, titled “Livestock Vaccine to Reduce Greenhouse Gas,” the vaccine, developed by CSIRO Livestock Industries, inhibits “methanogenic archae”--organisms that inhabit the rumen of animals and produce methane when breaking down feed. The report adds that the methanogenic organisms consume up to 15 percent of the food that the animals ingest. Even though factories don’t involve farm animals or methane-producing bacteria, the underlying thought process is similar. The value-stream analyst must assess all input and output streams to see where waste might exist. visible. The underlying principle is identical to that of the chemical-engineering material and energy balance, in which input and output streams must balance. This analytical approach requires chemical engineers to identify waste streams as well as the desired product. A debit/credit accounting format, in which debits --i.e., bills of materials plus energy and supplies, such as cutting fluids --must equal credits, also works. Analyzing the BOO, which includes the product and all waste streams, is another option. disposal location and see what’s being thrown away. Where did the waste come from? Can the process that generated the waste be improved to mitigate or eliminate it? Is it cost-effective to break down empty boxes to send them back for another load instead of recycling them or throwing them away? Can the boxes be relabeled and reused to ship the company’s own products? Henry Ford had a very clever solution for empty wooden boxes: He disassembled them for use as Model T floorboards. shavings--and some operations can waste 80 percent of the metal in this manner--the BOO must show not only the parts, but also the metal shavings. In addition, there’s probably a significant energy cost for reducing this much metal to scrap. Although the bill of materials might not specify supplies such as cutting fluids, the complete material balance must do so to reflect the manufacturer’s purchase and disposal costs. • It’s necessary to identify all process inputs and outputs, including energy and waste products, to force material and energy waste to become visible. • Money not spent on waste disposal, or on materials that leave the factory as anything but product, flows directly to the bottom line. 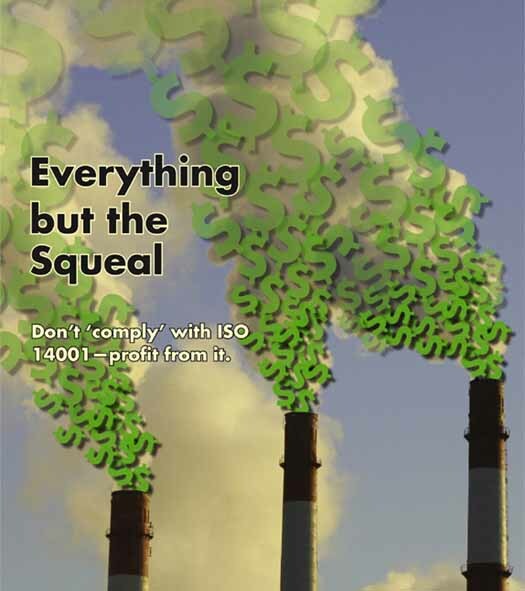 This principle can guide the profitable deployment of ISO 14001. • Lean manufacturing techniques such as DFM can help reduce or eliminate material waste, including not only recyclable materials, but also pollutants whose disposal adds to the cost of production.